I know I declared 2012 the year of the cake, but when you have a 4-tiered double ganache Orange Devil Cake (I’ll post on that later) to eat between just 2 people, you can only eat so much. My prescription for Cake Overdose (it’s real. look it up 🙂 ) is pie! 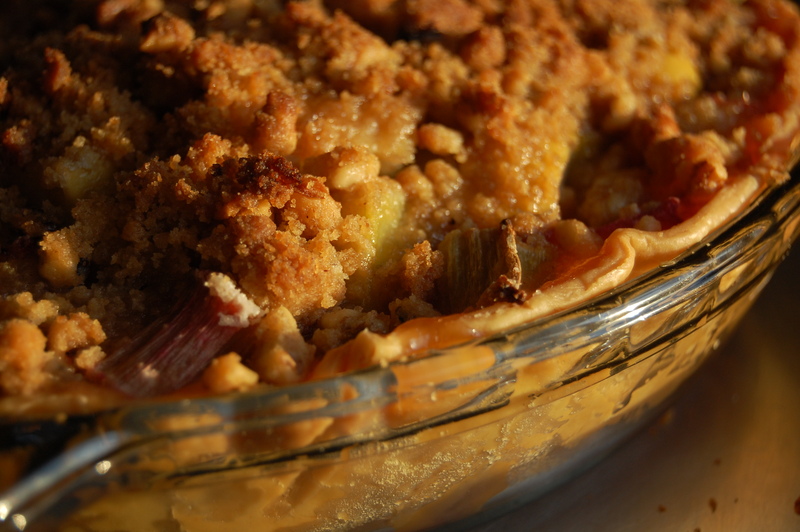 If you’re like me, you should have lots of rhubarb in the freezer from the summer harvest. And I’m sure you have lots of pâte brisée in there as well! Actually, it’s just dumb luck that I have all that in my freezer. In fact, I almost I forgot that I had all that rhubarb; it was rediscovered when I was looking for those frozen raspberries that I had from raspberry picking when my family came up a couple of months ago (and I still haven’t posted on that raspberry pound cake. . . probably cuz I didn’t make it yet, and now I can’t cuz I have no raspberries. . . and yes I do realize that there is a grocery store just 2 seconds away from my driveway). Guess I used up all my raspberries making yogurt smoothies. But I digress. . .
There’s no real recipe here; just change my Dutch Strawberry Rhubarb Pie a little. 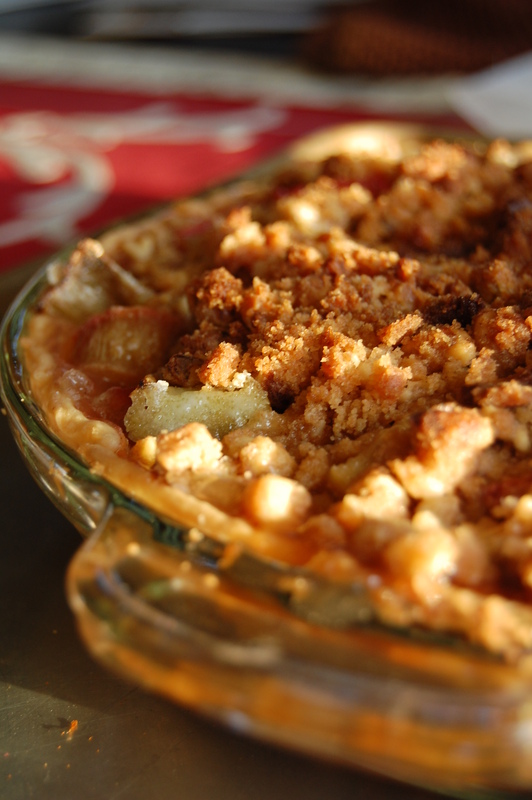 For the topping, replace the sugar with some loosely pack brown sugar and add 1/4 c. chopped pecans. 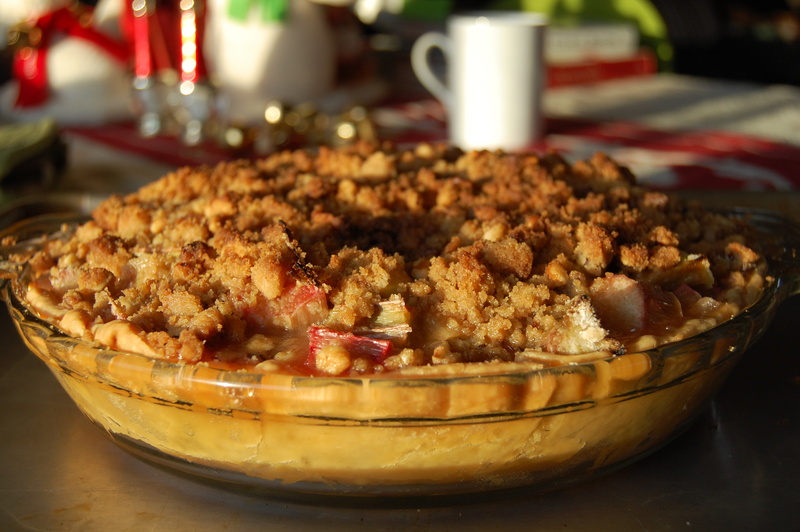 For the filling, instead of 4 c. chopped rhubarb and 2 c. strawberries, use 5 c. rhubarb and 1 apple, chopped. Now add 1/4 c. crystallized ginger and you’re good to go! You will have to tent this with foil because the pecans in the topping will burn if you don’t — I got distracted with barking dogs so there is some slight “crispiness” on mine. No problem because I like a little, er, caramelization on my pastries. This entry was posted in Pies and Tarts, Recipe and tagged Food, Pies and Tarts, Recipes. Too much pie to eat? Just drink it up! Yep, that’s why we end up sending leftovers to Katherine’s work. This pie looks fantastic. I haven’t combined apple and rhubarb, throw in the ginger, wow. Sound so good! Especially love the addition of the pecans and ginger! That crumb crust looks deeeelicious! I love that you found buried treasure in your freezer.. if only mine had pate brisee and rhubarb!! This would be perfect to make today! isn’t it weird the things you can find if you just look? I wish we had leftover rhubarb in the freezer. this sounds delish! This looks so good! I love anything with rhubarb in it. rhubarb is great. i don’t believe how long i waited to actually start baking with it!